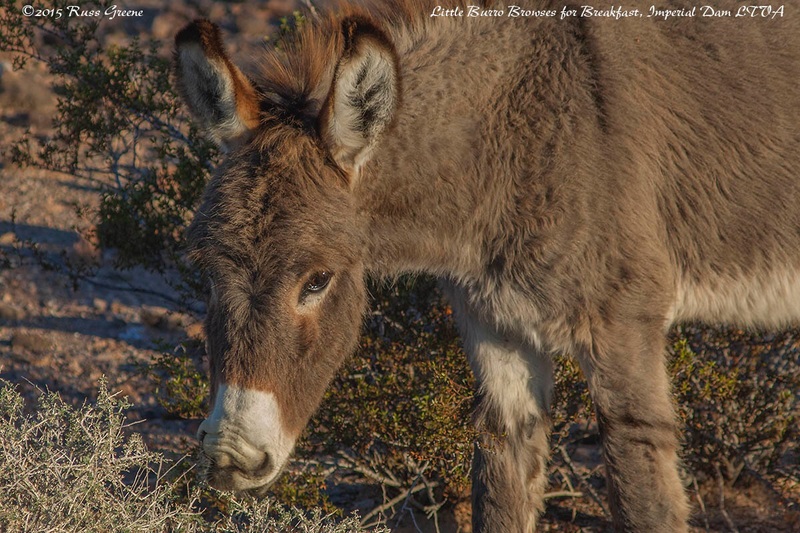 This Little Burro is just so cute. Don’t you think ? He’s wild but he lives here too. Wow. It’s hard to believe that a week has passed since my last post, but it has. You should know that as I write this post Sunday morning at 9 A.M. it is already beginning to feel a little bit hot. When I first came outside my RV this morning to sit in the sun, a cup of very sweet, fresh French-press-brewed French Roast in hand, I was wearing shorts and a T-shirt… and it was warm and delightful outside… AND IT IS FEBRUARY!!! Now, I don’t say this just to make all of you who are braving the blizzards of the north and east, or the windy chill and rains of the Pacific northwest envious… oh who am I kidding, YES I AM! HA! If it it will make you feel any better it will probably be a little uncomfortably hot here later today, somewhere near 90º, but don’t feel like you’re getting even with me because it’s just a temporary hot spell we’re having and things should cool off to the more perfect mid 70s to low 80s before too long. Late yesterday afternoon and early evening, wearing roughly the same attire, I attended a surprise birthday party for my neighbor Doug. It really wasn’t much of a surprise as he had figured out it was coming, but that’s not the point. What is? Well, the point is more about the fact that out here in the Sonoran desert, in the nearly barren, rocky, inhospitable terrain, during the winter months is a place that people call home, and there is community, not just camping. 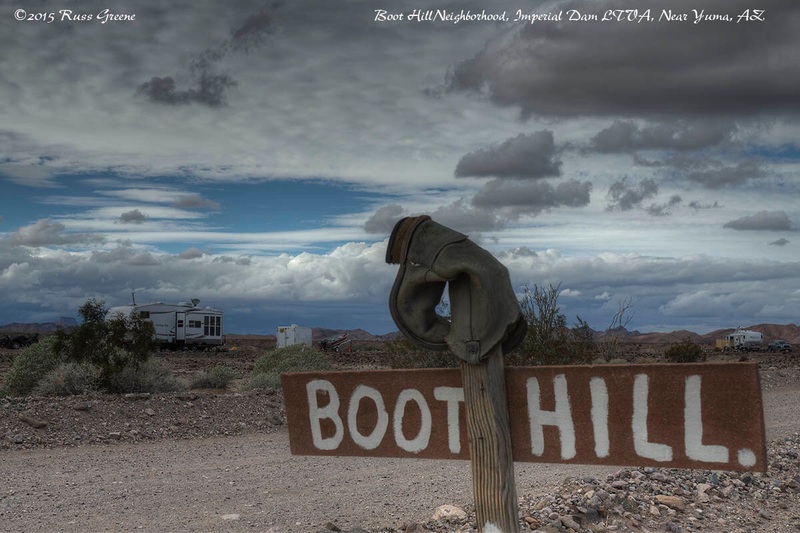 Boot Hill Is one of the neighborhoods at Imperial Dam LTVA. I think this one is unofficial. Nevertheless, the sign has been there many years. One camper guessed that the boot has been there about ten! There are stories behind things like this which are always fun to hear told. Sitting in the warm desert air, most folks in the shade of the host’s RV, about 20 invitees had assembled to help Doug sign off at the end of one more year and to greet the arrival of the next. I hadn’t met these folks before but I did learn a little about some of them. Doug, also known as North Wind–everybody here has a “handle” which may be a result of the use of CB radio–and his wife Lyn, A.K.A. Desert Rain winter here but live during the summer in northern California not too far from me. Another couple comes here from northwestern Montana for the winter, and another from Canada. Still others live full-time in their RVs and home is wherever they happen to be. Talk in the group included conversation about 4 wheeling Jeep adventures and misadventures people had been on together during their stays here, a funny story about how somebody had moved a police car–I didn’t hear the part explaining why–and when the officer returned he thought it had been stolen, cops soon descending from everywhere in large numbers, lights flashing and sirens blaring. The teller of the story said he pointed out to the officer that the patrol car was simply in back of the building and suggested that the officer had merely forgotten where he parked it. That may not have been exactly as it was told but the story was very funny in large measure due to the skill of its teller, whose handle, by the way, is SlobberJaws. When I sat down to join the group I was asked “what’s your name and your handle?” I said “I’m Russ and my handle is RussOnTheRoad.” Later, I announced that I thought RussOnTheRoad was too long for a handle and I decided to change it to something shorter. “What’s that?” Someone called out. I thought a moment, uncertain of what it might be, then I said “Why not call me what everybody else does? Handsome.” People laughed, but I think it may stick–as l was leaving somebody said “Hey Handsome, what’s your real name again?” “You can just call me Handsome” I replied. 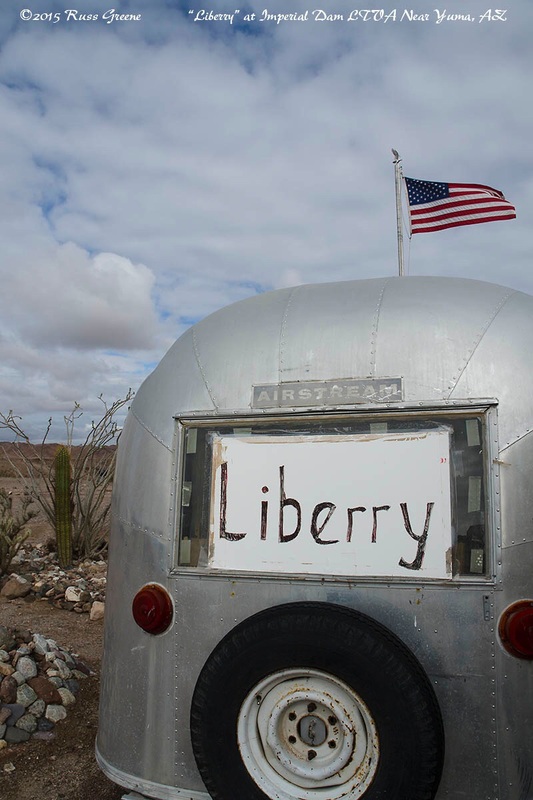 The Liberry at Imperial Dam LTVA is operated and maintained by campers inside a small Airstream trailer. Take a book, leave a book. Since my last post I’ve also discovered the nearby Christian Center. It’s pretty much surrounded on all sides by the LTVA. The reason I mention it has naught to do with religion, but rather that the center functions as a post office for many “residents” camped here. If you’re willing to fill out a registration form you can receive mail there. You can send mail without registering. They also have an Internet center where you can connect with your own device via WiFi or use one of their work stations. There is no fee for any of this although a $1 donation is requested for Internet access. The center also sells propane, offers a telephone message service, storage facilities and has non-denominational services on Sundays. I mention all this because, religion aside, the Christian Center is in my mind very much a part of the sense of community I’ve observed here. I’m working on a Campground Report for the Imperial Dam LTVA. Because this area is so large and has so much going on the report is proving to be quite an undertaking but hopefully it will be along sometime soon. Great to hear from you! I’m in the Okefenokee swamp! Stay tuned for a report.